In particular, I feel we need to ditch a "dual network" approach which is incapable of growing cycling much beyond its current share of transport and making it an option for everyone. Education and training, encouragement and so forth are important, but to make cycling significantly more popular than it is already we need to give people the option to cycle with minimal interaction with fast or dense motor traffic. Oxford's cycling modal share for journeys to work is 17%, which ranks us behind only Cambridge in the UK. Someone with average fitness who is reasonably confident, like myself, can cycle pretty much anywhere in the city. Some schools have high rates of cycling (Cherwell high school 58%; Philip and James primary 22%). And Oxford also has a decent bus network, one of the few cities outside London that does (which may help explain why cycling rates lag Cambridge's). But the commuting cycling rate was around 17% when I moved to Oxford four years ago and shows no signs of signficant change. Many adults — including people in their thirties fitter than I am — won't cycle from fear of traffic, most schools have much lower cycling rates, few parents will let younger children cycle independently, if at all, and so forth. Oxford is not a "transport paradise" — for cycling, a paradise would look more like Utrecht, or the Netherlands more generally. To make progress towards genuine mass cycling, we need to set our sights higher and push for really high quality cycling infrastructure. A Dual Network should cater for two broad categories of cyclist. Those who are happy to use whatever cycle provision is available, which may be in part or whole along trafficked roads, are looking to use the fastest, most direct route - the "cycle freeway". Others who are less time-pressed, or who prefer to avoid traffic for reasons either of perceived safety or for leisure preference or lesser experience, want a Quiet Route, often off-road altogether. Both need to be built to designs that permit not just standard two-wheelers but also cycles with trailers or tagalongs used by families, or the disabled, or tricycles, or cargo bikes. The standards to which the two networks are constructed should be no different, but the engineering designs are likely to have to solve different problems. Freeway route design must pay greatest attention to minimising the hazards of close traffic. Quiet routes will have to take especially into account interactions with pedestrians, whether shared-space or segregated. Both networks, but especially the freeways, need sensible, direct and effective connections to the routes connecting with more distant localities beyond the ring road. For the actual details, the excellent cycle map produced by Richard Mann shows "quiet" routes in blue and and "fast" routes in red. Firstly, fitness and confidence are not bimodally distributed, either among current cyclists or, more importantly, among people who might want to cycle. (If we're aiming for ubiquitous cycling, the latter category is going to include most of the population.) So attempting to cater for cycling with a dual network is likely to produce some facilities that are only really comfortable for the fittest and most confident few percent of the population and other facilities which make too many compromises. The London Cycling Campaign recently committed to campaigning for "cycling facilities that are uniformly attractive enough for everyone to use, including faster commuters and children" and David Arditti explains the motivation for this. Secondly, either network taken by itself is incomplete and too sketchy to serve its current or proposed clientele. This can be seen in actual use, and in the reasons many people don't, or rarely, cycle. Vehicular cyclists who actually prefer main roads, for a slight gain in speed, are a small fraction of people currently cycling (my experience is that even in Oxford locations where it is clearly safer and easier far fewer than 10% of cyclists will "take the lane") and a tiny fraction of potential cyclists. Fast cyclists will also use quiet routes when they're the most direct (which is only a problem where quiet routes involve shared space with pedestrians). A much bigger problem is that people who, regardless of their fitness or speed, don't want to cycle with fast or dense traffic just a strip of white paint away are left with a crippled network. Without excessively circuitous routing, it's necessary to use the "freeway" routes on trips of any length. The current plan basically concedes that all these major arterial routes — the ones which connect key centres and which people actually want to use to go any distance — are to be the domain of fit, confident cyclists only. The main "quiet" route from East Oxford into town is a circuitous route up the towpath, with loops and switchbacks. And it's suggested that less confident cyclists coming from town to Iffley Rd should make getting through the Plain roundabout easier by using a route via Dawson St and Circus St. For occasional recreational cycling, these kind of routes may be acceptable. But few people are going to commute along them, or use them for everyday utility cycling. The time of the many people who don't want to share the road with fast-moving or high-density traffic is just as valuable as the time of more confident people. And even for shorter trips, getting to schools, shops, and other local destinations often requires cycling at least short distances along arterials. "Network" means a continuous, uninterrupted route, provided for cyclists in both directions. A constantly-heard criticism of the present provision is that it is not continuous. Signs that display "End of Cycle Lane" must be consigned to the museum. While we have two networks, at least one of them is going to be stopping and starting all the time. For a significant fraction of current cyclists and a huge proportion of the people who might want to cycle, or cycle more, being dumped on a 1 metre advisory cycle lane right next to notionally-30mph-but-often-40mph traffic is effectively a "Stop Cycling Here" sign. 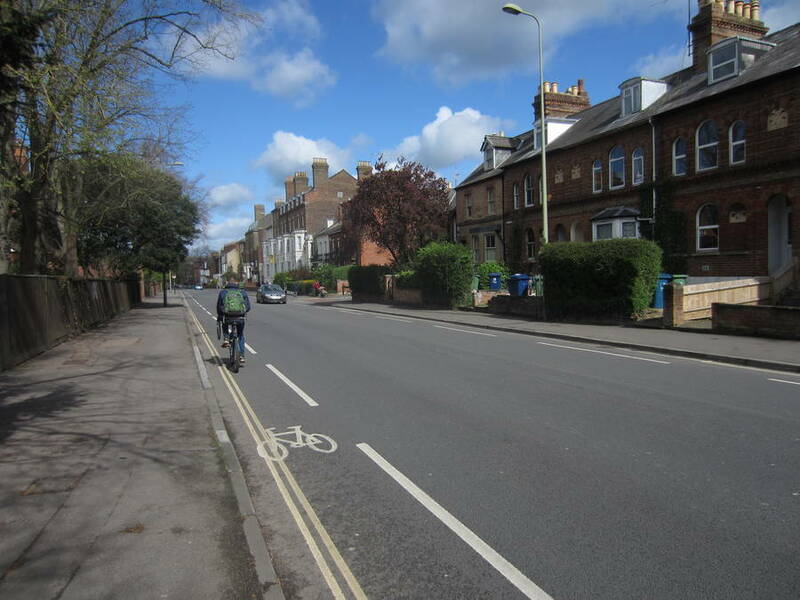 As a first example, consider the stretch of Iffley Rd between Donnington Bridge Road and the Plain roundabout. 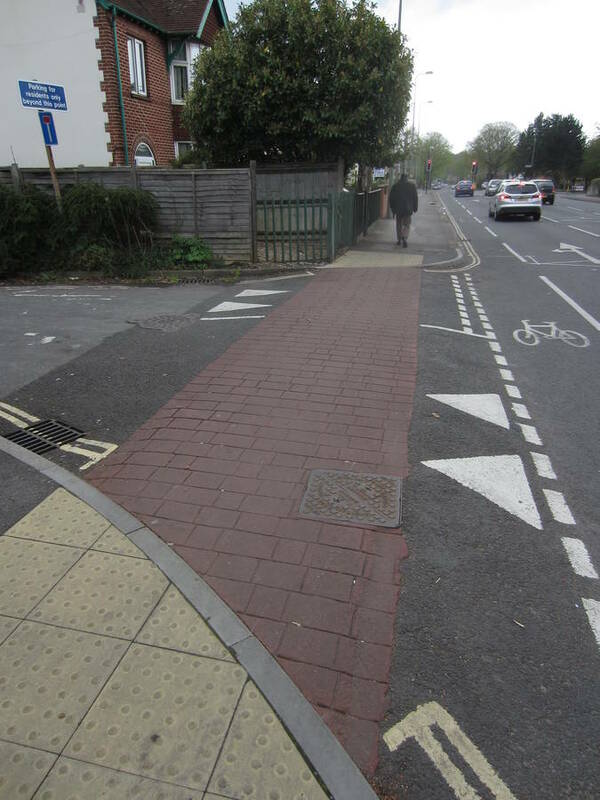 This was resurfaced finishing in 2012, so represents current thinking about cycle infrastructure — by the council but also, given the lack of alternative suggestions, by cycle campaigners — and is likely to remain in this form for a decade, given the limits of funding for road works. 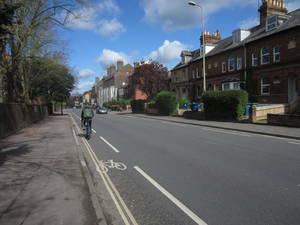 Iffley Rd is a busy A road, with this stretch carrying some 11,000 vehicles and 2100 bicycles a day (those are annual averages, so term-time / working-day / peak-hour rates will be much higher than those numbers would suggest). It is mostly 30mph, but it becomes 20mph at Circus St. There is no marked centre-line. The cycling infrastructure now consists of advisory cycle lanes, 1.1m wide, with good smooth surfaces and no problematic covers or gratings (but with vertical kerbs reducing clearance on the left and thus the effective lane width). The lanes are continuous heading north, except at the bus stops, with double yellow lines (though delivery and utility vehicles can be found parked across these fairly regularly). Southbound the cycle lanes only run from the Plain to James St, with single yellow lines and no parking between 8am and 6.30pm, Monday to Saturday; from James St to Donnington Bridge Rd there is mostly no provision for cycling. The other significant feature of the reworking are broad, gentle humps across the side-entry roads, raised so as to make the pavement continuous and marked with a reddish "tiled" surface. These were designed to make pedestrian use more pleasant, and they certainly make life easier for anyone pushing a stroller, but also serve quite effectively to slow entering traffic and thus protect people cycling. At least the northbound cycle lane here is quite possibly the nicest stretch of its kind in the city: cycle lanes on similar arterials elsewhere in Oxford have much worse surfaces, or stop and start, or run on pavements. So what's the problem? The basic problem here is that the cycle lane is simply too narrow, leaving cyclists too close to too much traffic moving too fast. Overtaking other cyclists is impossible without using the traffic lanes, while motor vehicles face the same problem, having to either enter the cycle lanes or come right up to them in order to pass larger oncoming vehicles. The result is that bicycles and motor vehicles are continually in potential conflict, with less separation than even the advisory lane markings might suggest. Cycling here one is regularly two seconds away from catastrophe — all it would take is a badly-timed wobble, an unthinking pedestrian stepping off the kerb, a distracted driver, a piece of debris in the cycle lane, a chance coincidence of large passing vehicles, or some combination of such events. The in-lane bus stops don't help, forcing bicycles to merge with motor traffic and then to take turns sharing one half of the road with traffic going the other way. The narrowness of the cycle lanes also means that anyone using a bike trailer or cargo bike will have no spare room at all. The CyclOx statement talks about "designs that permit ... cycles with trailers or tagalongs used by families, or the disabled, or tricycles, or cargo bikes", which seems barely compatible with 1.1 metre cycle lanes. (The Irish National Cycle Manual suggests a minimum total width of 1.5m in 20mph areas and 1.75m in 30mph areas.) And of course the problem is even worse on the southbound stretches where there are parked cars or no cycle lane at all, with most cyclists hugging the kerb in between parked cars, resulting in an sinusoidal trajectory that produces regular and often abrupt merges into the traffic flow. Update: I don't mind cycling along this stretch of Iffley Rd, but I don't find it relaxing: I'm continually monitoring for pedestrians, parked vehicles (on both sides of the road), large vehicles oncoming that will need extra road space, debris (or signs) in the cycle path, and slow cyclists I might need to overtake, while staying aware of vehicles coming from behind, or cyclists overtaking me, in case I need to move out of the cycle path. There is no way I would cycle this accompanying a cycling six year old. And I know fit adults who find this too intimidating to cycle. A related problem is that many of the "quiet" routes, while notionally 20mph, in practice carry much faster traffic, or large volumes of traffic. In some cases they are more intimidating, and potentially more dangerous, than the "freeways". Warneford Lane is a 20mph "principal quiet route". This was resurfaced in early 2013, again with no calls for any substantial changes, so this also illustrates the limits of Oxford council/campaigner ambitions for cycling infrastructure. That consists of the same 1.1m cycle lane, sandwiched between the traffic and car parking — given the car parking space is so narrow it's impossible to avoid wing mirrors or larger vehicles protruding into the lane, effectively much narrower than the Iffley Rd cycle lanes. The cycle lanes disappear for one bus stop on each side of the road, and towards the Gypsy Lane junction, though there is an ASL there for cyclists turning right into Roosevelt Drive. There is a shortcut exit onto Divinity Rd, allowing cyclists turning left to avoid entering the roundabout. 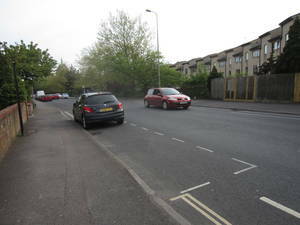 Because this is a divided carriageway with no traffic calming and (with the advisory cycle lanes) a decent apparent width, it sees regular speeds much higher than 20mph (this is one location where I regularly have to remind my partner of the speed limit, even though she cycles along here herself). Connecting Morell Avenue and Divinity Rd to the west and Old Road, Roosevelt Drive and Gypsy Lane to the east, Warneford Lane is also busy, with an annual average daily traffic flow of 9,600 (in 2011). "sign posts and lamp columns reduce effective width by 750mm"
Again, the basic problem is that this route involves cycling too close to too much traffic moving too fast. The layout also means the cycle lanes here are in the "door zone" for pretty much their entire length. I am perhaps influenced by the fact that I use Warneford Lane when I do the nursery run, but this is the least comfortable part of that — if the weather has been good I prefer a route across Warneford Meadow, even if that involves walking the bike part of the way. I've also noticed that some people resort to cycling on the pavement here. A large high school, Cheney, is just off the Lane. I have been unable to find figures for cycling rates here, but see relatively few children on bicycles and suspect they are much lower than the Cherwell School's. 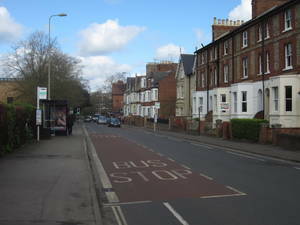 The Lane is a key route to the Churchill Hospital, which experiences severe parking shortages in peak periods, and Oxford University's Old Road Campus, as well as other major destinations. And it is the only direct route between much of Headington and East Oxford (and, continuing, to the centre of town): it is a considerable distance to the just as unpleasant Hollow Way to the south or the intimidating climb of Headington Rd to the north. So this is the only practical route for a significant number of possible cycle trips and its current state is likely to be detering a large number of potential cyclists. Apparently there is "no history of cycle accidents involving vehicles doors being opened, or other accidents where drivers are frustrated by cyclists choosing not to be in the lane", but the absence of accidents says nothing about the unpleasantness of dealing with irate drivers or the extra stress imposed by the door risk. Near misses contribute a lot to making cycling unattractive. There may be no easy options in these two cases, but I can find no evidence that anyone even thought about more ambitious alternatives. It must be possible to at least consider reducing parking provision, surely some of the grass verges on Warneford Lane could be sacrificed, and even the width of Iffley Rd isn't immutable - the frontages on the west side seem quite large, and it would be quite appropriate if the University sports centre gave up a bit of land to improve facilities for pedestrians and cyclists... Funding is obviously a constraint, but improvements here are surely the kind of works for which cycling grant money could be sought. Ultimately, it is possible that the only solution would involve imposing traffic restrictions (or a congestion charge) on Magdalen Bridge, which would drastically reduce the traffic on both these routes, along with traffic calming to make sure the remaining traffic actually stays below 20mph. If we don't even try to tackle these kinds of problems then we'll never get anything better. To do this, we need a framework for looking at cycling infrastructure which highlights these things as problems, not one which lets us sit back and relax, on the grounds that Iffley Rd isn't that bad for the fit and confident, that a legal speed limit of 20mph somehow makes Warneford Lane fine for children to cycle along, and that people always have the option to push their bikes on the pavement or take some circuitous alternative route. "for well-designed and properly implemented dedicated bike infrastructure, to encourage everyone to ride. [for] cycling to be the quickest, most direct way to get to our shops, workplaces and schools"
The existing structure should be repurposed as a dual approach to implementation. On the one hand, roads where speeds can be limited to 20mph — not just legally but in reality! — and where traffic volumes are low or can be reduced, may not need much work. On the other hand, where traffic speeds or traffic volumes are higher, we need protected cycle paths to separate cyclists from motor vehicles. Basically, I'm proposing we adopt the guidelines of the London Cycling Campaign, for 20mph speed and 2000 passenger car units per day limits on routes where cyclists are expected to mix with motor traffic, as explained by Rachel Aldred. Redesigning back roads for cyclists can follow on the good work already done with the 20mph speed limit, attempting to make that a reality and not just a legality, and some local streets could be further reduced to 15mph. 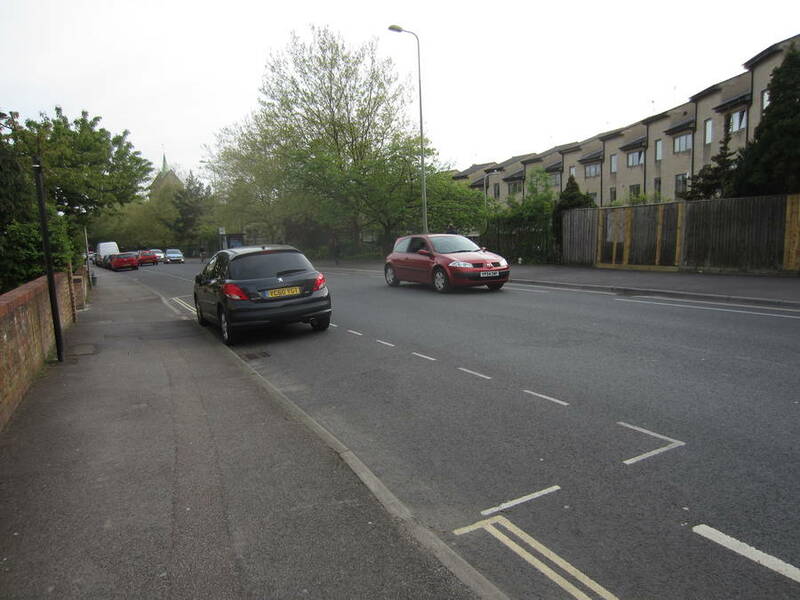 Traffic calming measures can be extended — something like the Iffley Rd side entrances described above could perhaps be used in internal junctions. Further routes could be blocked to prevent through traffic, ideally in conjunction with parking controls and other planning, driven by the residents who would benefit most (and suffer any accompanying inconvenience). Other 20mph routes (there are quite a few like Warneford Lane) carry too much traffic for calming to be enough. These are effectively major arterial routes and should be labelled as such and treated in the same fashion. The cycling infrastructure here needs to be built to a standard that anyone can use it, feel comfortable using it, and feel comfortable having their children use it. Otherwise we're going to be stuck with the role for cycling we already have. We've come far enough in Oxford that no one is unaware that cycling is an option, and most people have cycling friends and acquaintances who both encourage them to cycle and provide access to advice, the possibility of borrowing bicycles, and so forth. Personalised travel plans, cycle training, encouraging people to be more confident, and so forth can build on this and expand it, but can only go so far. The bulk of the population simply isn't going to cycle on a regular basis if they have to spend any length of time in close proximity to fast or dense traffic. This is the only way to turn Oxford into a real transport paradise, where everyone between 8 and 80 has the option to cycle to school, work, shop, and so forth. If we want a cycling environment as pleasant as that of the Netherlands, we need to build infrastructure as good as theirs. We need to be more ambitious: we won't get anything unless we fight for it. Superb piece, thank you for taking the time to write it. Quite right. You have analysed it correctly. Underlying the dual network approach (and I did not know that Cyclox had ever spelled it out as clearly as this – no wonder they have got what they have) is a completely illogical idea, that those who are not prepared to interact with fast and heavy traffic on bikes are prepared to use inefficient, awkward facilities on bikes. This is about as logical as saying "Those who wish to be vegetarians must like chickpeas". Offering the vast majority a third-class service in terms of cycling convenience will never be an attractive offer when there are alternative transport modes available. The vast majority must be offered the first-class service to get them cycling. "Both networks, but especially the freeways, need sensible, direct and effective connections to the routes connecting with more distant localities beyond the ring road"
is very interesting for it's "especially" clause. Why "especially"? That gives the game away as to which user-group the author identifies himself with. Dual networks will always be incomplete, as you say, so they can't be true networks. I don't think the CyclOx strategy has been such a bad one - it was probably the fastest way to get to where Oxford is now, with cycling a significant, high profile part of the transport mix. The problem is that the approach that worked fine for the first 15% of potential cyclists isn't going to work for the next 15% (let alone the 15% after that). Iffley Rd is as good as it is going to get. There is just not enough room to have it serve as a better arterial route for cars, buses, cyclists and pedestrians. You would need to look at alternative routes for traffic. On Warneford Lane it would be possible to build a separated cycleway but it would involve shifting parking, losing parkland and rebuilding the whole road and surrounds, and I can't see that being viable until it is a key link in a cycling network that is carrying half of all traffic. Cycling activists here (Australia) and in the UK have tended to lobby for right of way on straight-line, flat, on-road routes so that they can cruise at high speed and travel faster than cars. That isn't what works in places like The Netherlands or Denmark though where there is a high percentage of journeys by bicycle. And as you say it doesn't seem feasible to build two separate cycling networks, especially before you shift people out of cars and on to safe cycling routes reducing traffic. You don't have it too bad though. The official cycling route between Epping and Carlingford runs parallel to Carlingford Road using back streets with the lowest gradient, which is the quickest. However, it is a high speed rat run for locals, the school and metro bus route, narrow single lane road with no overtaking (lined by tree planters and with parked cars in between them on the sides) and still hilly. One suspects that Parramatta Council hoped that cyclists would cause traffic jams and force cars off the back streets. RTA cycle routes in my area include the left lane of sections of The Cumberland Highway. A defacto six-lane freeway where B-Double semis travel at 90km/h (or faster) with few intersections (they blocked off most side streets). There are signs saying "watch out for cyclists" though (presumably the red-brown stains in the left hand lane if it hasn't rained). This road has gotten so bad and forms a wasteland running through the district so they are digging a hole and putting it underground. The shoulder of the M2 and M7 are also main cycle routes where cars are doing 100km/h and cars and cycles cross paths at exit ramps. You do need safe separated routes through high speed and high traffic areas that form a connected network to wherever people want to ride. But you don't need to separate bicycles everywhere or slow down cars in low traffic areas. There are plenty of residential streets in suburban areas where sharing is perfectly safe as long as drivers overtake when safe. you don't need to separate bicycles everywhere or slow down cars in low traffic areas. There are plenty of residential streets in suburban areas where sharing is perfectly safe as long as drivers overtake when safe. I think "so long as drivers overtake when safe" is the problem here. There's always a small fraction of drivers who will overtake unsafely, mostly from unconcern or ignorance but occasionally from malice. And if we want the more vulnerable - 8 year olds and 80 year olds and less-abled 40 year olds - and less confident to be able to cycle around these streets safely then it's not enough that there are very few cars on them if those cars are doing 30mph (50km/h). Also, if traffic volumes are low, there's not much cost to lower speed limits. But Oxford has a blanket 20mph limit except on a few arterials, so speed limits are not the issue. There needs to be better enforcement or engineering in a few places, but those are mostly high volume routes like Warneford Lane and Roosevelt Avenue. (And if fully segregated cycle paths were put in there - which would involve moving the parking and the kerbs, but would only eat into some unused grass verge, not parkland - it might make sense to raise the speed limit from 20 to 30.) Some Oxford back streets need a bit of engineering, but mostly they are narrow enough to stop people speeding. Sydney suburbia poses a whole different range of problems, as your examples show! It's 2018 now. Nothing has changed. I found myself cycling Warneford Lane today, and was riding well out of the door zone alongside the parked cars. At the next set of lights I received a telling off from a woman driving a Mini, who could not understand why I wasn't cycling in the "cycle lane". Apparently she thought me ungrateful for not using the generous strip of tarmac allocated to me. Would she cycle in the door zone, I wonder?